The project “Social Interactive Care System to support the wellbeing of people living with dementia” (acronym: Many-Me) is a European research project within the Active and Assisted Living Programme. Many-Me is realized under Call 2016 “Living well with dementia”. The Many-Me project aims to improve wellbeing and help to overcome physical, psychological and financial problems related to progressive intellectual deterioration which is a characteristic symptom for dementia. 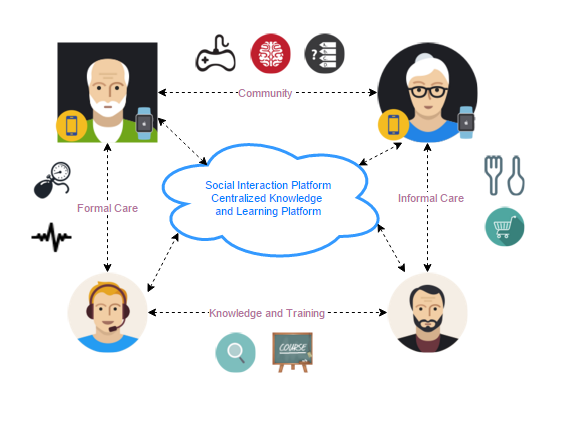 Many-Me builds a social interactive care system using information and communication technology (ICT) and user-centered services to help people with dementia, their relatives, informal and formal carers. Placing older people in long care homes is not a good option, both in terms of financial burdens and, particularly, negative influence of new environment on older people (especially those with dementia) and their dislike for this option. Therefore we believe that seeking for holistic approaches concerning not only people with dementia, but also their relatives, informal carers, is of a great importance. The latter face high pressure, lack of time and capacity for giving care as well as changed behavior of the diseased people. In result, they often fall in depression. A novelty brought by Many-Me is a personalization of content of an ICT support. People with moderate and mild dementia are generally able to use simple electronic devices which enable to improve their self-confidence. However, appropriate design and meeting the real needs of people with dementia, are among main challenges that providers of an ICT care systems for older adults must try to overcome.